Thank you for all the comments on the style experimentation, gang. As a reminder, the regular black outlines will return to the strip’s art style on Thursday’s update. I placed Todd and Jessie in black borders to help them stand out from the background a little, based on reader feedback. I thought about re-doing outlines for them, but I don’t wanna fall behind on strip production more than I already have this semester, so I hope this is a workable compromise solution for the blobby low-contrast problem. Thank you for your patience! I mentioned earlier that this chapter is an excuse for me to do some worldbuilding, and Amishtown is part of that. It is one of Calumet City, WI’s big tourist attractions: an amish-themed amusement/water park located in the heart of the city. No visit to Calumet City is complete without a ride on the Barnraiser, a rollercoaster that reaches speeds exceeding 100mph and spans the perimeter of the entire park. I would go there. Getting me to leave would be nigh IMPOSSIBLE. I love these comics. Keep it up, hmm I like Jessie too….hmm…maybe you should do it so you see her whenever they go to walmart, or the they run into each while shopping. She won’t be a regular character, but would appear often enough. Actually, I’d love to ride the Barnraiser. I think you should make the black lines a little thicker. I love the new art you have chosen, last update was… mehish. 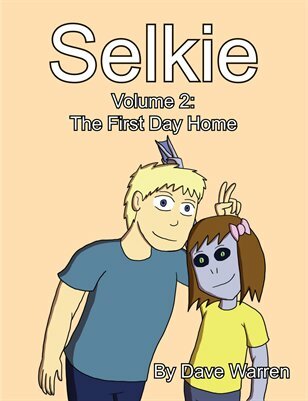 This however is gives it a art that says “SELKIE is MY COMIC”. The art use on the last page I have seen before and really didn’t say “Selkie comic” at all. Anyway keep Laughing. I dunno…it still has a somewhat blobby feel, but it’s not as bad as before. I still prefer the lined format myself. Out of curiosity, does Jessie mean Girlfriend as a friend, or as a more romantic form of girlfriend? I wondered that myself. Combined with the WWJD reference, makes it rather unusual. I forgot the word “girlfriend” has two connotations. She means the “I am dating her” variation of the word. Jessie is a christian lesbian. I thought so ^^ thanks for clearing that up for me 🙂 it’s nice to see a fellow GLBT person in a webcomic,even if she might not appear that much. Is it an AMISH roller coaster? I LOVE his expression in the last panel! She get’s fired a lot. She’s works EVERY SINGLE STORE they go into. Obviously save C’est La Feet, as she shops there. You can go “The Room” route, and make every store clerk look and act exactly like the same person and be “immortal” and a “super-star” like Tommy Wiseau. Tommy Wiseau is awesome, and, because you lack the skill to have is face, you can always parody his art. I live In Milwaukee Wi, and I’ve never heard of Calumet City. Exactly where is it? It’s fictitious. I stole the name from a small city in Illinois, where I live. I happen to notice that Wisconsin just so happens to be a Great Lake State. This wouldn’t happen to be significant, would it? Oh, ok. Only thing I could find was Calumet county and thought the internet was messing with me. And you should so take Slekie to Wisconsin Dells in the future. I would love to see what she would do at the little park where they have the giant fish and maybe ride on the ducks on the river. So sorry to do this, but you live in Cal City, IL? I live there/here… whichever. Very cool to live near someone so talented. I LOVE this comic! Still massively cool that you live in Illinois – and that you know where Calumet City is (well, at least that it exists, LOL). Of the three variations we’ve experienced, I think that the second one (the comic previous to this one) is the most pleasing aesthetically. The first one is a good, solid choice, but I think this one balances good aesthetics with a “comic-like” look. If I had to choose between the three, I’d say keep this one for the comic-looking aspect. The lack of inner border really works well. Aaaaand suddenly I’m sold! I like the black background+darkr colored outlines look in this page! It works brilliantly! Also, am I the only one who thinks Jessie is freaking adorable? This is a really good style. The only thing that might make this better is having some inner lines that separate color changes that are of a darker shade. Sort of like how you did the fingers when they overlapped the bodies. Mostly something to separate the face from the hair. Basically, something other than thick black lines for the inner lines. Even thinner black lines might look better than uniform black lines. I must say, at the very least, the backgrounds do look really good. Especially the ones on December 9th. Is Jessie going to be a recurring character? I wanna know if I can add something about her to the TvTropes page. The styles are less hard on the eyes than the fact that you’re using low-contrast, very pale colors. Pale tan skin + pale yellow hair and pale pink + paler yellow + pales in the background mean that my eyes actually hurt looking at the brightness of the image and trying to resolve the different parts of it. Can you maybe darken up the backgrounds at least, and try to make the people a little more contrasty? Shadows help the eyes relax. To be honest it will be a while, possibly a year or more, before I get around to introducing more of Selkie’s species. But, if he would like, I could do a drawing of your little brother as a member of Selkie’s species. So this brings up a question, are there other species of humanoids like selkie? Or is that prying into possible future story lines? Great! ^^ if I may ask, does he have short hair? Long? Blond brown red black? Any favorite activities, baseball soccer etc? I know I’m going against the crowd here but I don’t care too much for this style. I prefered the artstyle you used in the strips posted on the 2nd and 6th. The artwork from the 9th just appeared too CGI and this one comes across looking unfinished to me. As for the story though… I’m hooked. Enough so that I would buy a hardcopy version just to be able to share it with friends. Is there one coming out soon? Might because my glasses get some glare from the comp, but still it makes making out details difficult. This artwork is a step in the right direction. Check out lackadaisycats.com — in some of the special artwork, you see how the artist has pulled off a similar style, with heavy form outlines and lighter, gentler shading inside. Try giving more strength to the “lighter” lines. Try darker shadows and lighter highlights. The “light” features look too washed out right now, but I think a little fiddling can turn this into a good style. Er, that’s not exactly what I meant. I was talking more blending with a faded outline to make it look better. What’s Dubya Dubya Jay Dee?? It’s a phonetic version of WWJD (What Would Jesus Do) with a slang-y pronunciation of “double-you”.